Club Penguin Cheats by Mimo777 Club Penguin Cheats by Mimo777: Paint Mimo's Toenails Contest! I think all of you liked the idea painting my toenails. 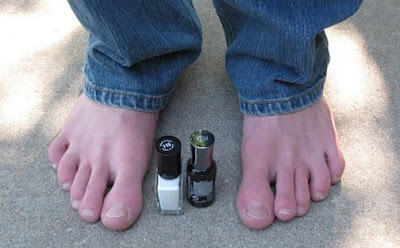 So I decided to give you all another shot at getting my toenails painted! So if Radio Disney plays Zebras Smell Funny, then ZoeZoe will paint my toenails to look like zebras stripes on YouTube! So let's send Radio Disney a bunch of requests for the song and get it played on the air! Click here to go to Raido Disney's request page. Step 1. Once you get there, click on "Can't find my song/artist..." button. Step 2. At the bottom of the page, put this, Mimo, "Zebras Smell Funny" in the blank "Enter Song and Artist." Step 3. Click the "Submit" button. OR CALL THE RADIO DISNEY REQUEST LINE FREE: 1-877-870-5678. Once you send your request, post a comment and let us know! Remember, if Zebras Smell Funny gets played ZoeZoe will paint my toesnails on YouTube! Link to this post on your web site! Tell everyone! Oh, and if you hear Zebras Smell Funny on Radio Disney, let me know! HEY! Here's another new game on Mimo Games, Planet Soccer LIve! Try it now! Mimo! Your songs are on Planet Cazmo! Espcaily, ZEBRAS SMELL FUNNY! :-DDD votes 1 million times! I just requested it! I didn't do it for the purpose of watching your toenails being painted, though. mimo can you do another "whats different contest"
Wii, keep on doing it until you die. Just kidding. Ok, I did it, lol. I DID IT! AND MY DEDICATION WAS: This is a dedication to mimo painting his toe nails! LOL! hey i voted again this is gonna be funny when you paint your nails!!!!!! Ok Mimo your a little weird. Were gonna have to wait and see. I love the soccer game thanks mimo its awesome. I submitted it but since I'm from Australia, I just said I'm from New York. hey mimo. i sent a request, and i hope it will air on radio Disney! i hope it does air, because it will be a truly remembered moment for you, your fans, your family, and for all of the people who happened to be listening to it. see ya soon! I just requested! If it isn't on the radio... can you do it anyway? What if I sing it to you? rofl i will soooooooo request! ur the awesome est mimo! Yea Mimo will do more what's different contests i'm sure. Don't worry. i requested it 51 times! mimo you are now crazy but you should really dye your hair black and white... and you said if aqua wins you will paint theme aqua! hey mimo i will vote but i never heard that song becuz i need somthing to download so can u post the song on youtube plz? Im sure he will soon :D That would rock! Ok i requested it over 50 times. hopefully thye will play that song. That song makes me crack up. Yay! I voted!! Im also going to put a link to the post on my site ;-) I'll listen to radio disney for ya Mimo! One more thing will you ever have another aqua party mimo? hi mimo i voted for it 10 times! I voted for the song. I dont live in the us i live in bc canada so i put i lived in washington. And bye the way when is ur next party on cp? HA HA HA HA HA HA HA AH! yay!! i wanna see u get your nails painted so im gonna go on radio disney and get that song put on and then when it gets put on you have to say, WOOOOOT!!!! or something random in your video. k? by the way, do you like the warrior cat series or animal crossing or both? oh yeah btw plz post this. I'm not going to stop sending requests until they put it on the radio. I sent it 12 times but im gonna send 1000000 more!!!!!!!!!! mimo im a huge fan of zebras smell funny! i will vote for it 10000000000000 times. AWESOME I DID I HOPE IT PLAYS I DEDICATED IT TO CLUB PENGUIN ROFL! I hope so! I love his contests! I hope he will some day, because I can't download it either, or the ZoeZoe podcasts. Waddle on! Yeah, I don't think it will happen. Soz, Mimo. Hey Mimo, I Voted and ill let ya know if its played! Probably not for a month. He may have a quickee party though. Just keep checking his site and his twitter. i totally agree that zebras smell funny. do you realize though that once your song is on the radio no one will buy your song on itunes anymore? Will we see ur face if ZoeZoe paints ur toenails? I don't think so... Unless Mimo's toes are located on his face. Lol! I requested it and sent an e-mail asking about the status. (how close we are to getting the song played) I'll post when i get some feedback! by the by, I dedicated it to Club Penguin, Disney, and all of their fans! that's what i typed, word for word. Keep on Wadell-ing! Mimo, I requested it one time. I was wondering if when you become a mod or mimo mod etc. you put your penguin name+mimomod, legendary mod etc. next to it when you're not answering a question. wow mimo, your toes are huge! i voted 20 times and was worn out at the end!!!! I voted for you!I really want to hear you on Radio Disney! (Ok I have no idea how you listen to it, but oh well! lol. i already play planet soccer live. I requested! we are going to see you having your toenails painted for sure! 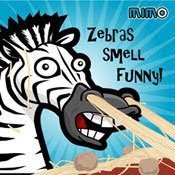 I like your song Zebras Smell Funny, but the best one I think is Decoding Mimo Finding Mimo. Hey how about a Zebras Smell Funny music video contest? haha, mimo's toes are so pale, americans never get a pocketful of sunshine while in our country near the equator, we always get burnt by a 67degree celcius temperature. btw, great idea! i already called my uncle at disney music productions asia and he said as soon as he finishes those thingys, he's gonna do it! just say if when would you like to have a something conference with him. I doubt it very much, Mimo likes to remain anonomous. If he shows his face everyone will know who he is, he will get stopped on the street and everything. To be honest if I was Mimo I would want the same thing. I requested 50 times. No joke. I hope you get your toe nails painted! WOW, are you telling the truth, your phones on the blink, JUST GO TO THE TOLIET, you have to go to school even if it's still raining WOW, that would have been to much for me as well!!!! I DID IT AND TOLD EVERY1 TO DO IT I DIDI IT LIKE 400 TIMES AND I TOLF MY FRIENDS FAIMLY ENIMIES GUY AT MCDONALDS NO IM NOT KIDDING! I WAS THAT GUY! Not really. Nobody else would have their toenails painted like a zebra! LOL! mimo u really want 2 paint ur toe nails dont u? LOL! Yeah sure but what is the number of Raidio Disney? I need to know the number!!! I'm not sure... So you live in Ireland? How is it there? My great-grandparents are imigrants from ireland, they came to America... so I'm in America! It might play on radio disney, but i don't know for sure. Plus if he does paint his toe-nails, he could possibly put the song "Zebras Smell Funny," in the backround while they are being painted. i voted! :D u rule mimo! I got it filled out! I will do it like 50 times a day! voted 10 times lol i wanna hear it!! i will vote at least 10 times! hey umm there is a channel on tv.it is....channel #867 radio disney its a xm channel.hope this helps! Did you count or was it an estimate? ok wii just CALM down it will be ok just dont panic ok.calm. that would not be good! kool, mimo. I cant go on too many sites but the ones i have permission to go onto, so i might not be able to. But good luck all you awesome peeps! Yes, he already knows that. But thank you for telling those who don't know and reminding those who forgot! BTW When is there going to be a new mission? I really want to make more of those contest videos, because I missed the last one. Please soon! You have got to be allowed! Mimo's reputation is only the line!!! I am not allowed to download anything so I haven't heard that on itunes. :( So I will do my best to help get it played. P.S. I hope no one thinks your weird (in a bad way) for getting your toenails painted. I did and my dedication was "for painted toenails"
hi mimo i just requested but i put a random name ( bob ) age ( 15 )and state ( Cali ) lol bye mimo thx for being awesome! hi mimo, i voted ur song in on radio disney!!!!! hope i hear it while im listening!!!! i called them and they told me they are getting alot of requests from this song lately. No one would ever think that. Besides, Mimo is weird in an insanely AWESOME! way. I was on CP and i went to go sled racing, it asked me if I wanted to play so i said yes but then it just carryed on with CP instead off letting me play. Are you having probs to or is it me? LOL! You should have a party for this too! Mimo, why dont you say where u are on cp if ur on? I was on CP and i went to go sled racing, it asked me if i wanted to play so i said yes but then it just carryed on with CP instead of playing off letting me play. Are you having probs too or is it me? Sorry, I haven't had any problems like that ever, Im sure it was just a bug. Email CP about it. well you can listen to it on planet cazmo planet cazmo got all of mimos songs! i voted mimo do i get some cheese now? YAYYYYYY i did it! I love Zebras Smell funny! I absolutly love radio disney! I've actually never heard your song, sorry mimo. Can't wait to hear it and see the awesomeness that it zebra toenails. Will you ask Zoe if she will do my nails after she dose yours?